You can centrally lock or unlock the vehicle from the inside. This feature may be useful if, for example, you wish to unlock the frontpassenger door from the inside or lock the vehicle before you pull away. The central locking button does not lock or unlock the fuel filler flap. ► To unlock: press button 1. ► To lock: press button 2. • and the SmartKey is restored to the factory settings, the entire vehicle is unlocked if a front door is opened from inside the vehicle. • and the SmartKey is set to an individual setting, only the front door that is opened from inside the vehicle is unlocked. 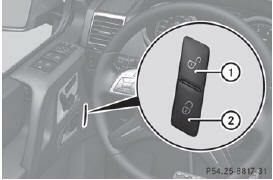 If the vehicle has been locked centrally with the SmartKey, it does not unlock if you use the central locking button. You cannot unlock the vehicle centrally from the inside if the vehicle has been locked from the outside using the SmartKey. It is only possible to lock the vehicle centrally if all doors are closed.